I love my kindle. It’s much better not having to carry around several books and I run out of something to read much less frequently. I still read and buy physical books but I don’t think reading on the kindle is a less rich experience. The one downside of the kindle, though, is I can’t see what other people are reading. Maybe a display panel could be added to the back, because I quite often read books that I’ve seen people reading on the train. 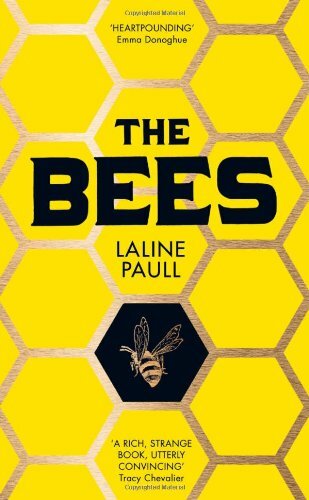 The Bees, by Laline Paull, is one of those books. It’s about a swarm of bees and describes a cycle of their lives. It’s told from the point of view of Flora 717, a worker bee who is able to transcend the bees’ caste system and take on several roles from nursery nurse to forager. Paull’s world is based on some facts about bees but is essentially magical realist in tone. The bees are anthropomorphised and the hive is turned into a golden palace. It does require some suspension of disbelief but if you’re prepared to give yourself over to this world it is truly lovely. In order to relate the events of the book, Flora has to be able to move out of the caste she’s born into and this is unusual. Most bees have their role and stick to it. Except foragers. Any bee can become a forager. But Flora is special and only she can save the hive. Flora isn’t so much a character as a device, but for this type of novel, it works. It’s not perfect, and the lack of any real danger to Flora lets the book down in a couple of places. Point of view slips towards the end and an authorial voice intrudes. I didn’t like the prologue and epilogue which offer a human view of the hive. The book would have been better without them, and the epilogue in particular was overly sentimental. I enjoyed the world-building. I was completely sucked into the book and found it beautiful, lovely, and captivating. Paull evokes both devotion and menace very well. There are some weaknesses to the book but, overall, I enjoyed it. It’s unusual, and what’s good is really good. And there’s a happy ending, which was the perfect choice.